Oh happy day! It's time for Five on Friday! And boy, am I excited about my five today. As always, I hope you'll join me along with Darci, Natasha, and Christina ... playing along is simple! Just write a blog about five things on your mind today, anything goes really, post the logo below on your blog, and then enter your post address below in the link-up section. If you don't have a blog, please leave your five in the comments below so I can read them! Girly food. Last night I had two girlfriends over for dinner, and by dinner I mean appetizers and wine! I used this platter that I received from Ian's grandmother, and I served green grapes, strawberries, and brie cups three ways. 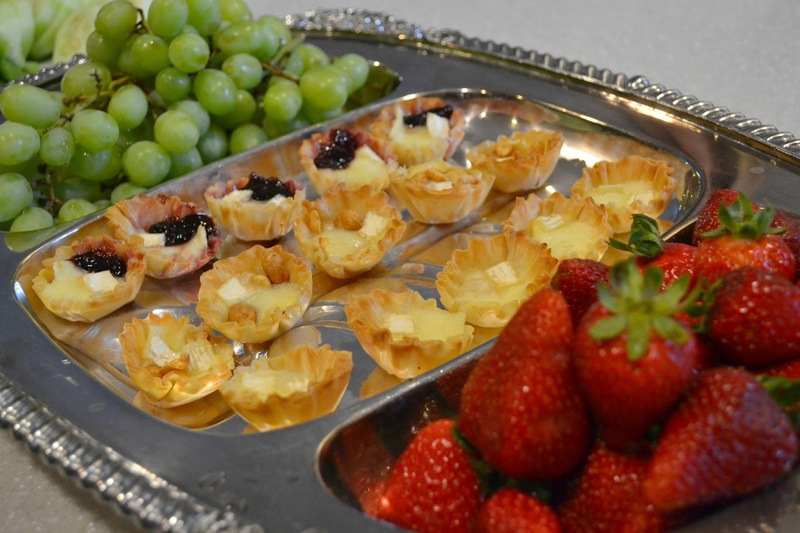 The phyllo dough cups had regular brie, brie with honey and salted peanuts, and brie with cherry preserves. The girls brought amazing appetizers as well, and we just picked and sipped all night. It was perfect! So here are the girlfriends I just mentioned. Let it be known: I just love these girls. Christina from Carolina Charm and Laura from Our Life In The Queen City are two very, very sweet gals who I just click with. There is definitely something to be said about finding friends like that! Especially when you meet ONLINE (ha!). Thank goodness for bloggers! We may have had a little hair party going on in my bedroom. Sally Girl mini nail polishes. These nail polishes are super inexpensive but really fun. You get them from Sally Beauty Supply and they are $0.99! The color goes on opaque and smoothly from the colors I've purchased so far. With a topcoat of Seche Vite, they look so professional and are long-lasting! I gave the girls their own bottles last night of one of my favorite coral colors. I popped in to Aldi yesterday and they had the most stunning two-foot orchids for $4.99. If you are an orchid lover, you know this price is INSANE. 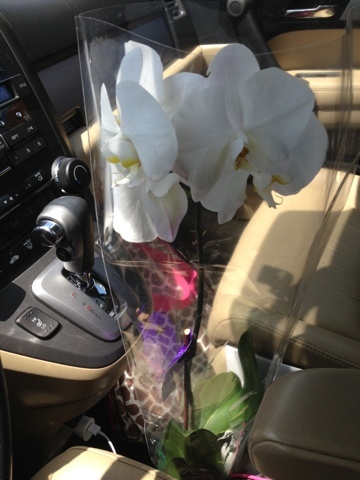 I got this perfectly white orchid and I love how the backs of the flowers are a light lavender color. For less than a Starbucks trip, this was such a find. Sweet Christina gave me this coconut shampoo that smells absolutely delicious! 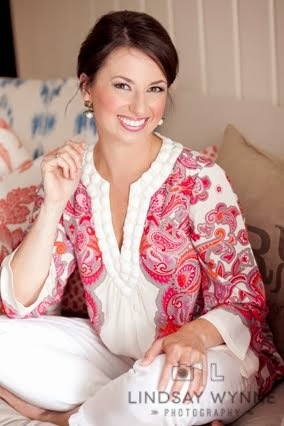 Our co-hostess for this linkup Darci is also a big fan and I can't wait to try it out! I love anything coconut and I've also been on a sulfate-free shampoo kick, so this was such a sweet surcee. That's my five for the day ... I am super stoked about the weekend (and a relaxing one at that!). Happy Friday to you, and I can't wait to read your five! Looks like so much fun! I love the mini polishes, such a cute touch. Your IG pics of the sock buns inspired me to rock a huge one today...along with some sparkly earings. CHEERS to Friday!! I may check out Aldi today. Thanks for the tip on the orchids! Love the coconut shampoo, too! I always get compliments on how shiny and healthy my hair looks when I use it! I love those cocktail napkins from girls' night! I might have to stop by our local Aldi to see if there are any pretty flowers...I had a bad experience with Aldi in Tennessee, maybe it's time to try again! I found DOUBLE sized Organix shampoo/conditioner at Bed Bath & Beyond at the beginning of the summer and have been *obsessed*. My hair's so soft and shiny, I really might just keep using it! xoxox, have a great great weekend, friend! Last night was PERFECT! And those brie cups were ridiculous!! Let's do it again soon! 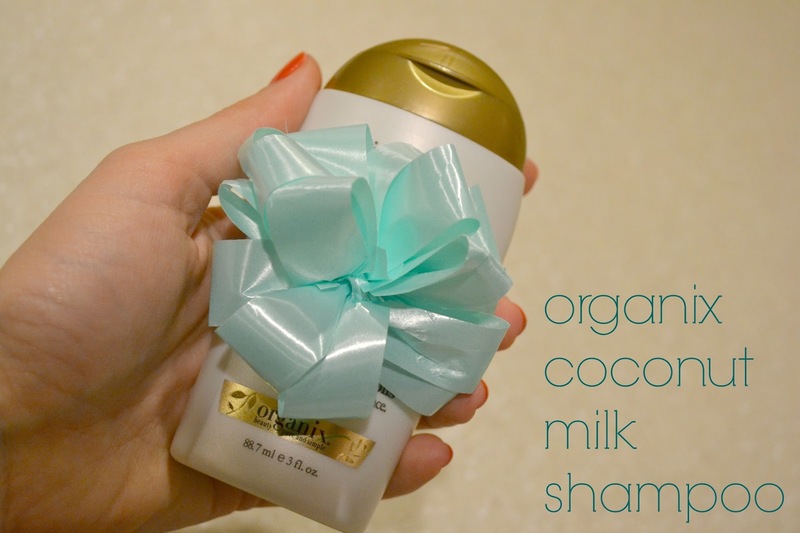 The Organix Coconut Milk hair products are my absolute favorite! I use them at night, post-gym, so I'm not only using great products but I can let my hair air-dry and smell the coconut-y goodness all night! Such a great find for the price. 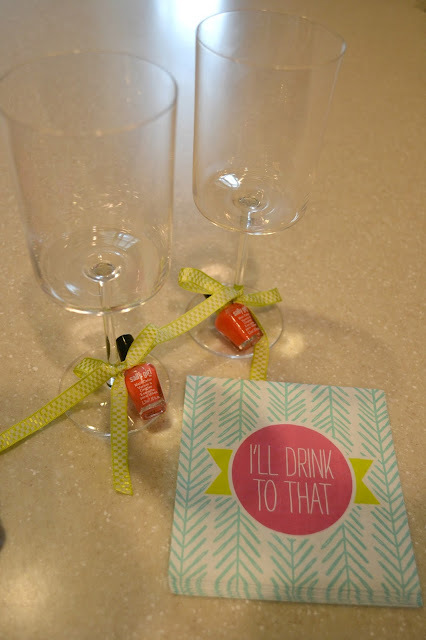 And seriously-- little nail polish favors for girls night? That's the cutest! Great times! I love orchids too, that's a great deal! And I'll have to try that shampoo. Happy Friday! I may need to run to local Aldi... I love orchids! Hope you have a wonderful weekend! Last night looks like it was a BLAST!! Girl time is good for the soul! 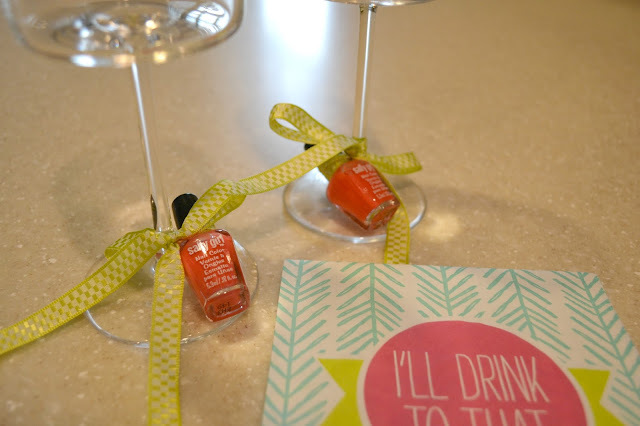 There are few things I love more than a girls night with girly food, fun nail polish colors, and lots of wine! What a perfect night! That's the shampoo I use and love it! Your girls night looks like so much fun! I love how bloggers embrace each other and end up being real life friends! That shampoo sounds amazing! I love anything coconut! when we have our girls weekend you HAVE to teach me how to knot my hair like that please!!!! those phyloo cups with brie and preserves are my go-to app...never can go wrong with those and they are easy peasy!!! That food looks to die for! Yay for hanging out with girlfriends and that BEAUTIFUL orchid. Have a great weekend! i'm always looking for a good reason to break out some yummy girly food! I need to be better at going by Aldi! That is a GREAT price!!! 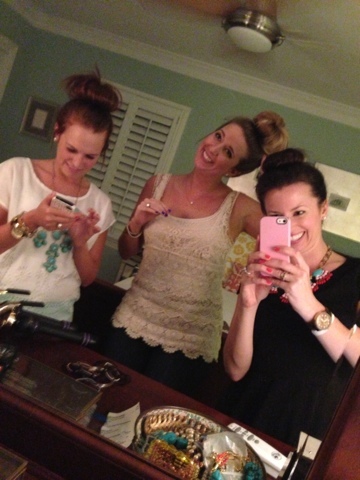 What a fun girls night and those nail polishes? darling! Your meetup looked so fun -- and what a great hostess you are! Girl food, drinks, buns, and nail polish? Sounds like the makings of a perfect evening! I love phyllo cups... and I love brie. And you for telling me to combine the two. Genius. Happy weekend! $4.99 for an orchid?!? Thanks for the tip! Love toes little polishes and your tray! I want that orchid! And I adore that shampoo- you'll love it! Those brie bites sound amazing!! Last Call For White Jeans? Au Naturel ... What Would This Mean For You?